PHOTO BY NICOLE WALBY Jim Dillingham of Scipio Township speaks to Seneca County commissioners and township trustees Wednesday about the possibility of intervening in the proposed Seneca Wind project. REPUBLIC — More than 20 residents who reside in the footprint of the proposed Seneca Wind project addressed Seneca County commissioners and respective trustees Wednesday during a public hearing. 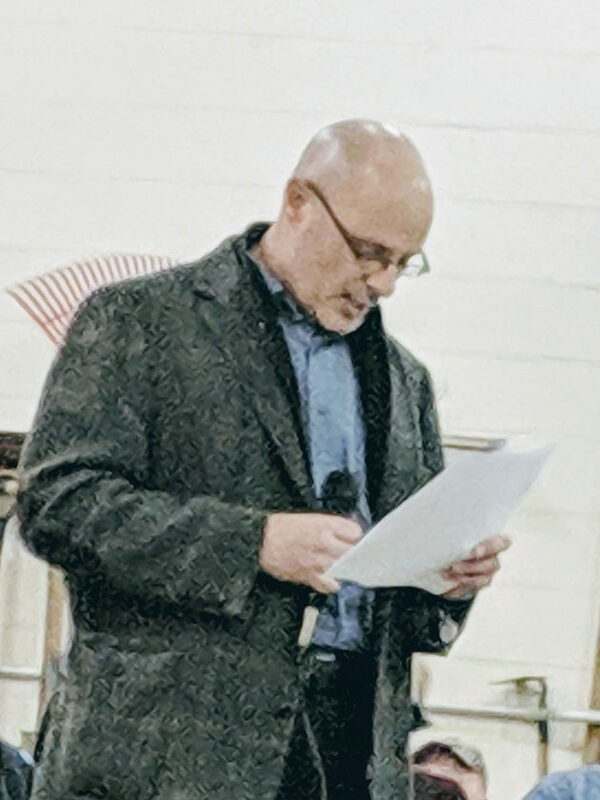 The public hearing, which took place in the Scipio Township Maintenance Building on SR 19, was orchestrated by Commissioner Shayne Thomas, who said he wanted a time to allow for the residents to speak and to possibly reach common ground on the option of intervening with the wind projects. Residents who spoke were from Bloom, Eden, Venice, Scipio and Reed townships. Those who spoke were given an hour for comment at three minutes each. First to speak was Chris Aichholz of Bloom Township, who is with the Seneca Anti-Wind Union. Aichholz said the group has obtained 2,500 signatures to petition the rescission of the alternative energy zone, and have distributed 4,000 “No Wind Turbines in Seneca County” signs and have hosted two large meetings. He said trustees in seven of the 10 townships under the footprint of the Seneca and Republic wind projects have voted to intervene, with five passing resolutions asking the commissioners to rescind the AEZ and PILOT program. Aichholz said time has come and gone to find compromise. Greg Smith of Bloom Township, also of Seneca Anti-Wind Union, addressed township trustees, pleading with them to intervene on behalf of their constituents. Smith also spoke of Carolyn Falter-Jolliff — Thomas’ mother-in-law — who signed a wind easement and lease agreement Aug. 3 with the Honey Creek Wind project. He said there is a conflict of interest with Thomas being in favor of the wind projects. Eden Township resident Jim Feasel said the solution to all of the controversy would be for the wind companies to re-write the wind leases and make them into solar energy projects. Feasel said sPower — the firm behind the Seneca Wind Project — has 66 wind projects across the country, with two being wind that are out west where the wind turbines are not around people or homes. Jim Dillingham of Scipio Township is a retired U.S. Army veteran of 22 years and has come back home to Ohio after 30 years. He said he may have to relocate due to the wind energy projects because of his detrimental disability designated by the United States Department of Veterans Affairs. Among his list of disabilities is chronic vertigo which is to be effected by the turbine shadow flicker and infrasound. Jodi Ranwand and Danette Martin spoke of living and growing up in Seneca County with their families having strong roots here. Their concerns are what will happen to their communities and family’s land. Commissioners received a notification Oct. 17 and have 30 days to respond to whether the county plans to intervene during public hearings on the Seneca Wind project application at the Ohio Power Siting Board in Columbus. Venice Township trustees are to meet Monday to make their decision on whether they plan to intervene in Columbus.